Inside the south entrance to the church is the headstone of Patience Johnson. As can be seen from the attached image, she had 12 sons & 12 daughters, but died in childbirth of her 25th child in 1717, aged 38. Her husband Shadrack had another 8 children with his second wife (the first was illegitimate). Statue of John Howard. For more details see http://en.wikipedia.org/wiki/John_Howard_(prison_reformer). Rear of the Court buildings and Council offices. The attached photo was taken from St Mary's Gardens on 7th December 2013. Start of De Parys Avenue. 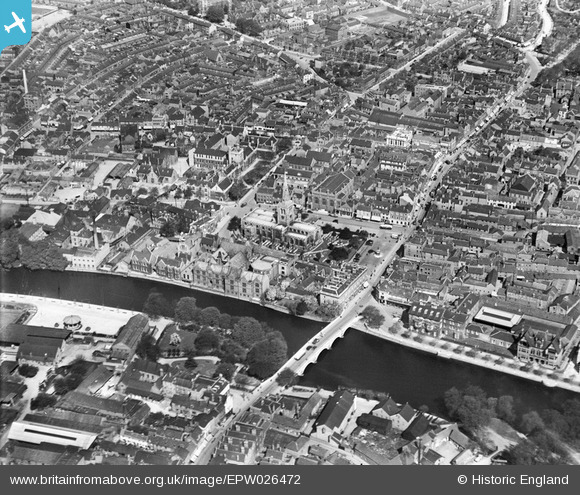 This area became Telephone House, forming a triangular building with sides on St Loyes Street, Harpur Street & Dame Alice Street. The photo was taken 13th June 2013 in Harpur Street with St Loyes Street going to the left. Silver Street. Towards the High Street end there is now a memorial bust to Trevor Huddleston (15 June 1913 – 20 April 1998) who was born in Bedford. It was rededicated by Nelson Mandela on 7th April 2000. The photo was taken 13th June 2013. Was a Montague Burton Ltd, the tailors, with a snooker hall above (Wilfred D Ham), but now a JD Sports shop. The photo was taken 13th June 2013. What was the library but now The Harpur Suite. The photo was taken 13th June 2013. Cheetham's Boat House. Now Bedford Rowing Club. CORRECTION - For Cheetham's read Chetham's. Barclay's Bank on the corner of Lurke Street & High Street. CORRECTION - This should have been Wellington Street. Rear of the General Post Office in Dame Alice Street. Dame Alice Alms Houses (row 1). Dame Alice Alms Houses (row 2). Top part of Harpur Street. The Saracen's head pub. Now Number 13, a bar and cafe, part of The Corn Exchange. Site of the Empire Cinema. Now demolished and replaced by shops. The photo was taken in the mid 1960's. Longhurst & Skinner furniture store, now Pilgrims Progress (J.D. 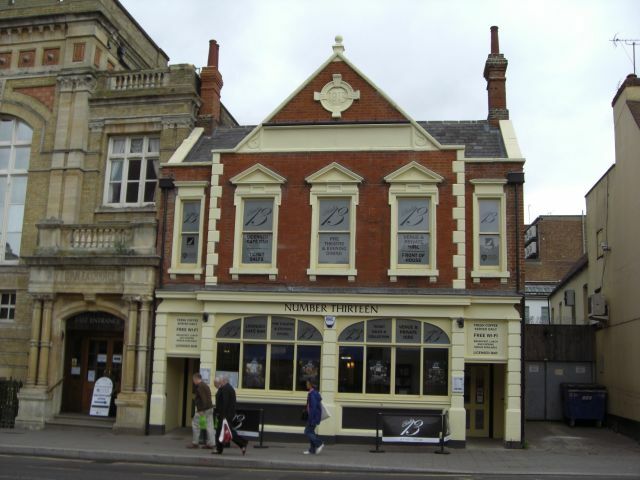 Wetherspoons pub). The photo was taken 5th April 2009. Murkett Brothers Garage. Now a Nando's. Bank Buildings. Only the one facing the market square remains. Bedford Town & Country Club. CORRECTION - This should read Bedford Town & County Club. White Horse Pub on the corner of Midland Road & Harpur Street. This was pulled down in 1929 and was replaced by the Marks & Spencer store which is still there. 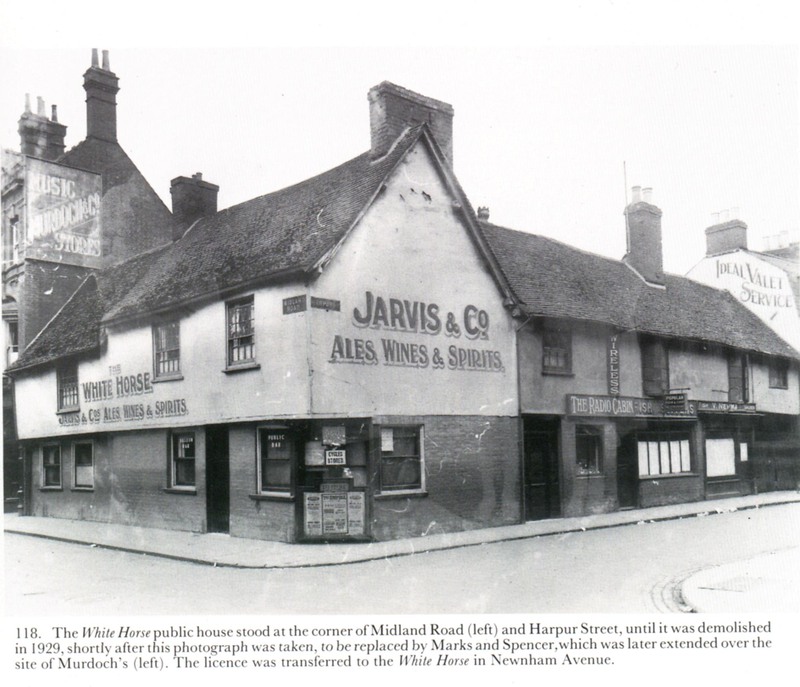 What was The Saracens Head pub. Now Number 13, a bar & cafe and ticket office for the Corn Exchange. The photo was taken 13th June 2013. 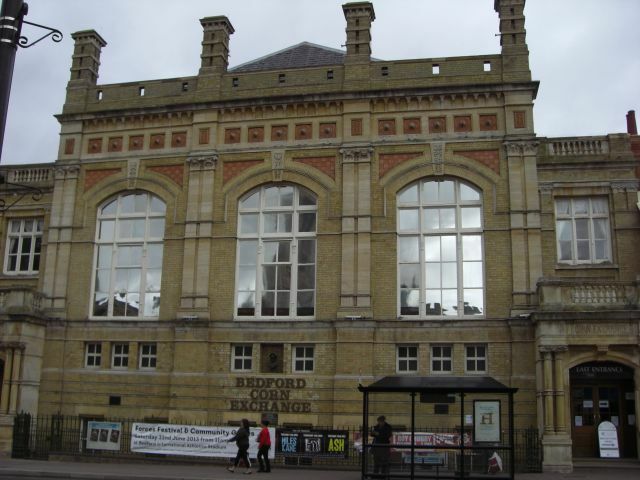 The Corn Exchange. This photo was taken 13th June 2013. The White Horse Pub, copied from a book of Bedford photos. One of my aunts was born here. Bedford High Street, 23rd October 2009. 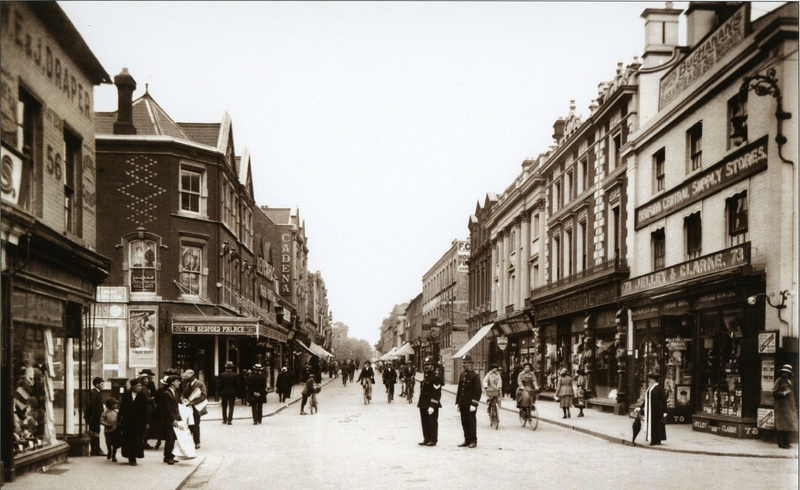 Bedford High Street, 1921, from a Francis Frith photo.